A beanie is head hugging brimless hat without a visor. Seldom are they adjustable. Our line of winter and summer beanies is very different. In our product like they come as large or small. They are generally comfortable and fit to most head sizes. The winter beanies come with a liner that has the print sublimation. The outer shell is normally 100% polyester and the inner lining is made of 100% acrylic, 100% cotton or knit. Typically, the winter beanies have a margin of space to show case the knit lining. The Knit lining can be which color the customer chooses and this serves as a reversible option. Some do not as per request by buyer. 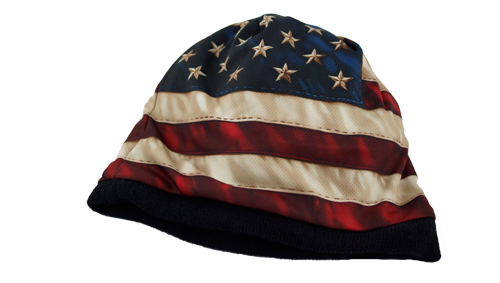 The summer beanie or skull cap is normally polyester with cotton treated as a antimicrobial material. The design leaves the to be very thin material strong material. The summer beanies do not have a margin edge. All beanies are made from antimicrobial breathable fabrics.